If you’re not utilizing social networks in your marketing efforts, then you’re missing out on some great potential especially on Facebook simply because they have over a 1Bn registered users, 44M+ of whom are from the MENA region. That’s a nice market to tap into, of course you will not be able to reach all of them but you can do your best to create a fan base so that you can engage with them and eventually start driving sales and leads for your brand. So how do you utilize Facebook to help your brand? Honestly, there are many ways! But luckily for us we have a simple case study from the MENA region where a company did manage to have some success using Facebook Offers. Facebook offers are coupons that don’t cost anything to create, but are promoted with a Facebook Ad campaign. Once they are live, when a Facebook user claims an offer, they will receive an email that they can show at the Page’s physical location in order for them to get the discount. Simple right? This feature has been available for quite a while to compete with the group buying websites. 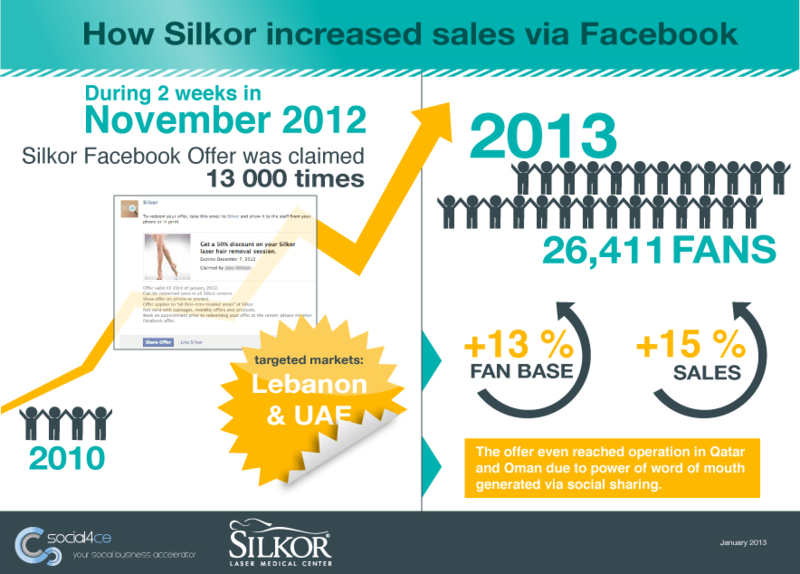 As you can see from the image above, Silkor who ran the campaign on their facebook page for 2 weeks in November 2012 managed to achieve 15% higher sales as well as increase their fan base by 13%, they’re currently 27K+ strong. They’ve managed to do this with the help of Social4ce which is a boutique consulting firm based in the Middle East and focuses on social business. In fact the campaign was considered to be such as a success that Silkor and social4ce were distinguished during the Facebook Studio Edge event that was held in Dubai on the 29th of January 2013 for the work that was done part of the Facebook offers program and the outstanding results that came out from it. Now I mentioned earlier that it is a simple case study simply due to the fact that there isn’t anymore details. I asked for more however Silkor didn’t want to divulge any information other than the fact that they want to focus and invest more on social media marketing in the future. I wanted to know information like how much money they’ve spent on ads, and about returning customers. The reason I wanted to know that, was to put things into perspective, because increasing sales is one thing and increasing profits is another thing, unless if you’re doing such a thing to increase your brand value. Would you like to know more about Facebook offers or social media marketing? Get in touch for a free consultation or signup to receive our newsletter.